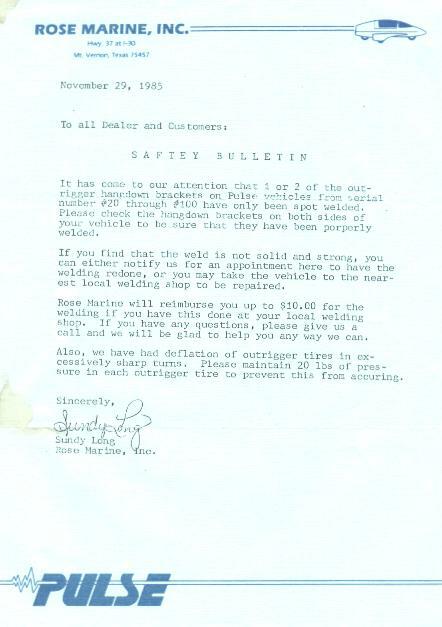 Don Rose owned Rose Marine Inc. of Mt. 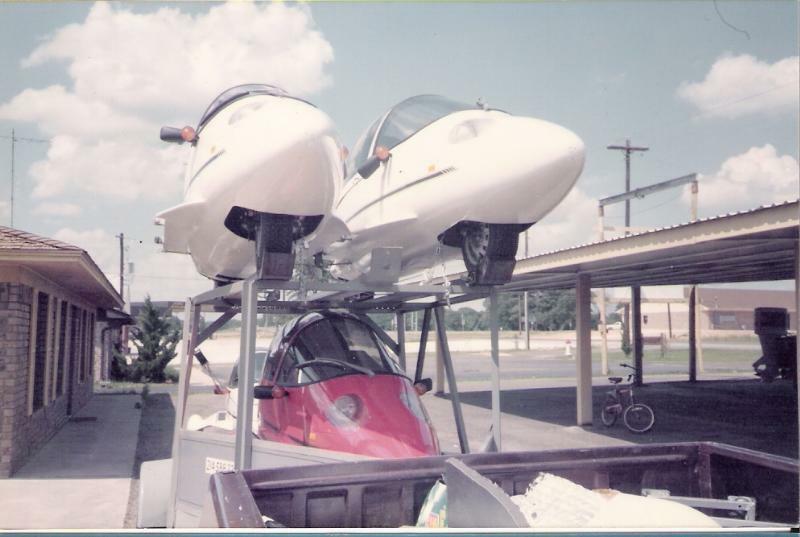 Vernon, Texas which sold sport boats and equipment. In 1981, he became a ten-state distributor for an ultralight aircraft company and became a large center for aircraft construction, flight training, parts distribution, and research and development. 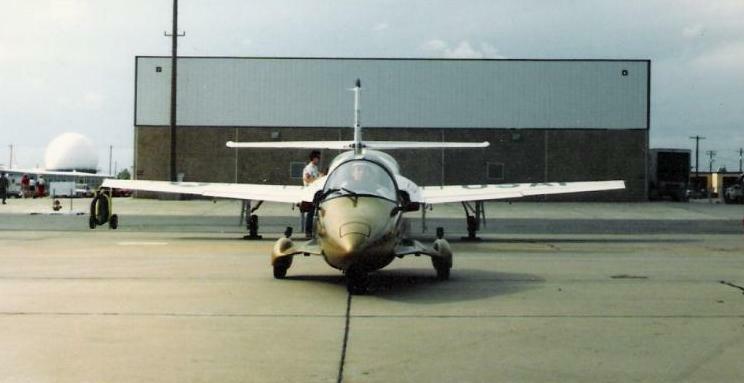 The business was involved in both the ultralights and the Litestar/Pulse at the same time and became known as Rose Marine and Air Sports, Inc.
Ginger & Don Rose in April of 2005. 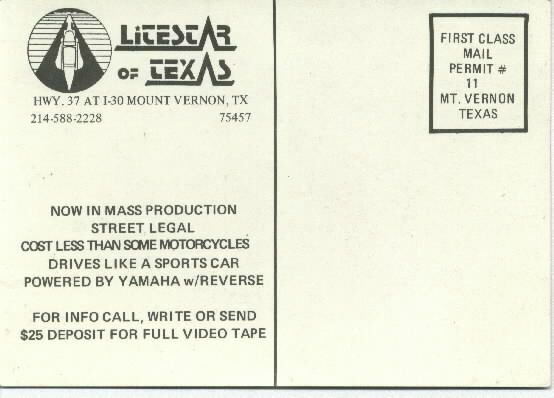 Don Rose, Arlon Fowler and Ben Scarborough were involved as Litestar dealers as soon as Jim Bede and Stan Leitner formed Tomorrow Corp.
Litestar of Texas, as they were known, a 6-state Litestar and Pulse dealership, actually got one of the first Scranton built Litestars. It was red in color with a VIN ending in #000100. Today it is owned by Michael McMahon. "Well, to begin with, we didn't expect the vehicle to be perfect. Dad told me a long time ago never to accept the first one. David Schwartz was real nice to let me have the first one. The canopy didn't fit the hole. The rails were less than rigid. For a show car it didn't really matter, but for demonstration rides it needs to be a little more solid. On the right side of the canopy where it comes up to the windshield, there's a gap of about this much. Of course he spent the last eight hours with them. We kept calling Ron Royer to be sure the car was going to be ready and Ron assured us that it was. It was going to go to the paint shop Monday, dry on Tuesday, Wednesday they'd just have to stick the tape on it and we could pick it up. So at noon Wednesday when Arlon arrived, we stuck to our schedule and found out then the price had gone up and Stan and Ron were having some problems. Arlon spent 8 hours with them. There was no canopy on it, no plexiglass on the canopy, there was no windshield when he got there, no plexiglass on the headlights or taillights. Everything had to be done and finished. He said that after 8 hours they were getting so sloppy that he decided he would rather take it on home and finish it there. So he loaded the car up and brought it home. We worked until two the next morning in my shop ....nitpicky stuff. I have a list of twenty some things here. But the first time we drove it we realized it could take up the whole lane. The white car drove real well. Jim Bede said all you got to do is move the front wheel back an inch. It's amazing what an inch will do. As far as performance, the car out-performs the white car. We checked the 0-60 in 9.2...that's no bull. The car will perform, it will hold the road, it will change lanes, it will do everything we say it will do. The bolts were all just tightened by hand, by the Scranton factory." The white vehicle mentioned above was built by Doug Walsh. "We brought it to Texas for a two or three week visit for some promotions and television news spots," Ben recalls. Arlon and Rhonda Fowler were the original owners of this red Scranton Litestar. He and Rhonda worked trade shows with Rose Marine and helped with deliveries, rallies, etc. but didn't work in the business on a day-to-day basis. 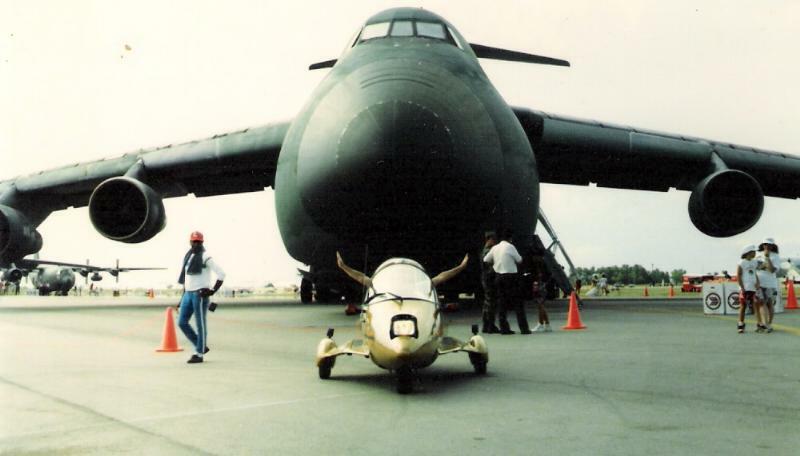 Arlon and Don started working together in the marine business and then started the ultralight aircraft business. Arlon had his own construction company, so flying and selling was more of a side-line for him. Donalso sold ultralights with the help of Kenny Crump. Early on in the ultralight market, you had to build them from plans and raw materials with only a few factory-built parts. Some customers didn't want to or couldnt build their own planes, so Kenny built several complete aircraft for customers. KennyCrump also was their Pulse transporter and he made many round trips between Mt. Vernon, TX. and Owosso. He and Don designed their giant trailer - the one that could haul eleven vehicles at a time. He also delivered vehicles to dealers and customers, helped out with some dealer prep in order to get vehicles delivered quickly, and helped in the booth at trade shows. Ben Scarborough is a band director. That's how he met Don Rose. Dons son, Brad, was in the 8th grade band and Don and hiswife traveled with the band as chaperones. 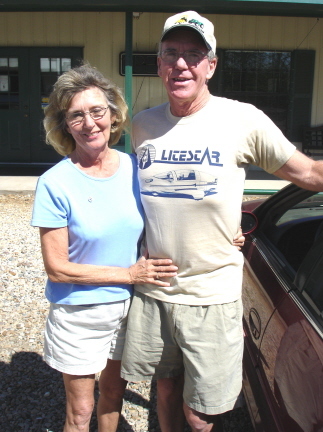 Ben was a pilot and aircraft owner and started hanging around the Rose Marine shop when the ultralights showed up and the business took off, so Don hired him and he retired from teaching. Don's sons, he had four, were also involved with the business. The two oldest helped out quite a lot. Brad built his own ultralight when he was 13 and flew with them all the time. He had his driver's license by the time they had Litestar vehicles and when not in school, he was always in the middle of things. Brad is a super salesman and worked air shows, boat shows, and auto shows with them from the time he was 14. He knew as much as any of them and people got a kick out of talking to a knowledgeable whiz-kid. His younger brother, Greg, was around a lot too and helped out with shipping, Pulse washing, mail-outs, etc. Ben relates the following: As soon as vehicles arrived from Owosso, they were picked up by the buyers or dealers or delivered. We had quite a waiting list. At times,we wereeven caught without any vehicles to show. I bought the serial #1Litestar for myself, and then the "Breezy Pulse", followed by a burgundy Pulse- but just couldn't seem to hold onto them for long. When Owosso Motor Car split with Jim Bede and Tomorrow Corp. after building 21 Litestars, they decided to change the name of the vehicle. I suggested the name "Invader" and several liked the name. The name was used for a handful of vehicles, but the factory's legal department said that name was already used by a boat manufacturer. The factory employed a consulting firm to come up with a name and that's where the "Pulse" name came from. Sue Butcher may have originated the name. All vehicles in our six-state area came through Rose Marine (Litestar of Texas) Mt. Vernon. We prepped each one because few of our dealers had developed sufficient knowledge of the vehicles to get everything right. We usually had a lot of work to do on each one before it left the shop. 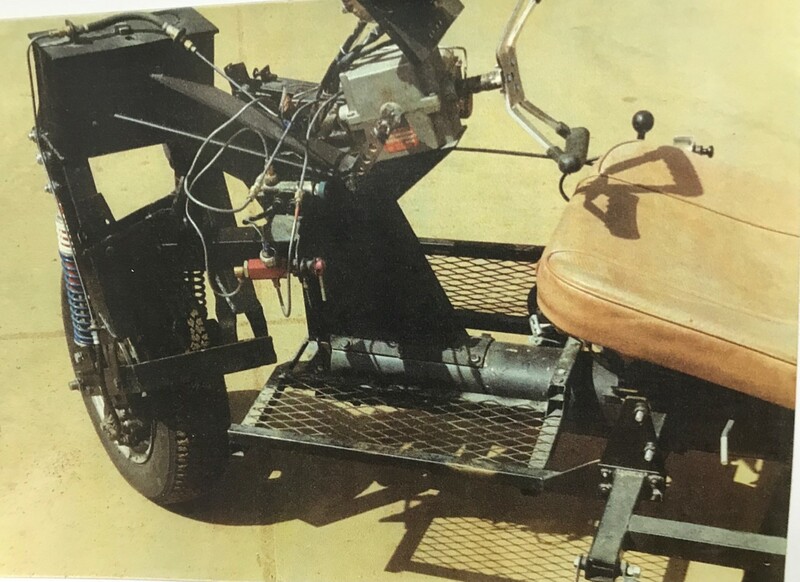 I remember on the first deliveries, we had to remove the front fork and do some cutting and welding to change the angle to get the caster right to prevent front-wheel shimmy. Come to think of it, I believe we were the ones who solved that problem for the factory. In one memorable trip, Don and I flew up to the factory to pick up four Litestars in the spring of 1985. We put trailer hitches on all four Litestars and made up two tow bars. We removed the drive-chain on two and hooked them to the hitches of the other two. Don and I each towed one vehicle. The plan was to drive halfway to Texas, then put the rear vehicles on the front for the remainder of the trip. Talk about creating traffic problems! Nobody would pass us; they just kept looking. Every time we stopped, we drew crowds. They followed us off the highway and we crammed gas station parking lots full every time we fueled. Of course, as we got further south, the engines were running hotter than we wanted to run them, so Don called our hauler, Kenny, to come pick us up with our small double-decker trailer and he headed toward us from Mt. Vernon, TX. We met up somewhere in Arkansas, I think. We put three on the trailer and we either took turns driving the 4th one, or hooked it to a ball hitch on the end of the trailer. The set-up looked similar to above pic. I recall two vehicles were sold to "The Price is Right" TV show which were both included in a package with some other items for price "guessing". A chauffer in California won them both. I have that show on video tape. At one time Hollywood producer called us to get a Pulse to use in a movie of some kind. They wanted us to take a Pulse out there at our expense, allow them to modify it, wreck and rebuild it a few times - all with their drivers, then give it back all fixed up - for us to come home, again at our own expense. No compensation whatsoever. We declined the offer! They thought we should jump at it because of the free advertising. Maybe so, but I didn't want the public's mental image of a Pulse to be one of it being crashed over and over. We had two of the charcoal grey Pulses. The lettering on the sides were two different colors. One was red and the other was white. 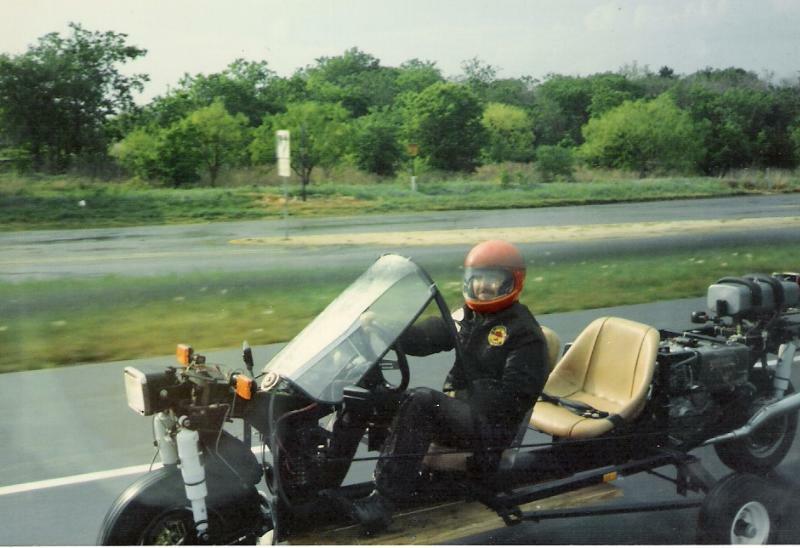 It had to be in early May of 1986 because Ben drove the charcoal Pulse with white lettering to the Beaver Rally (motorcycle) at Beaver's Bend Oklahoma near Idabel. Ben met his wife at a pizza restaurant in Idabel. It's the Pulse that got them together. Pulse #175 was grey and was sold to Guy Bowen San Antonio, TX. Pulse #176 was grey also, but no info on that one. Probably the gold Pulse on the trailer was #113 and was sold to Clifford Stroud of Texas and when it came through our lot for dealer prep, Don liked the color and ordered one for himself which may be Pulse #203 .... below. We installed a lot of reverse gears before delivery. I developed a simple heater/defroster system from a small hair dryer and most of our customers wanted that installed, too. Eventually, Ed Butcher had us fly up to Owosso and show them what we were doing and they made up their own from the sample that we took with us. Of course, they didnt use the hair dryer! Before delivering to our customers or our dealers, we adjusted clutches, brakes, etc. and spent a lot of time on every vehicle to make sure it was as close to perfect as we could get it. We had a blue Pulse that consistently got over 120 mpg highway. Some got as little as 75 - but nobody complained. We decided to have a Pulse built without the body as a demonstrator and sales aid. We called it the "Breezy Pulse" because driving it reminded me of flying my dads no-cockpit homebuilt airplane with the name Breezy . The vehicle was later sold and may have been returned to the factory by the new owner to have a body installed. It could be #212 because a vehicle originally registered to me is listed on the Pulse registry with delivery at about the right time period. I flew to Owosso and picked up the 'Breezy'. Naturally, it wasnt completed so I spent a couple of days getting it road-worthy. We had to come up with ways to mount lights, have a place to put your feet, and develop brackets for mounting the gear shifter and other items since there was no body to mount to. We made a Plexi-glass windshield because there was no way to mount a glass shield. I left Owosso one morning with snow on the ground and it rained on me the first 3rd of the way home. C-O-L-D rain! I had on a ski suit and made it OK, but it was not water-proof and I have never been as cold and wet for as long, in my whole life! I drove straight through with a few short rest stops and arrived at home in Mt. Vernon the next morning. As soon as I got home to Mt. Vernon, I removed the small square boards that the factory had installed for "floor boards" and put on the full length 2" X 12" boards so passengers would have a place to put their feet. I changed clothes, took a quick shower and got back on the road - and drove to the 1986 Spring Pulse Rally at San Marcos (near Austin). I arrived before dark, but keep in mind that in Texas, you can drive 16 hours in a straight line and still be in Texas! The total trip from Owosso was about 1,410 miles - all with no sleep. Everyone at the rally decided that I deserved the "Farthest Distance Traveled" award, even though I was a company employee and helped organize the event and even had the plaques made up. Someone must have really wanted to buy the "Breezy Pulse" because Ben did not keep it long. He enjoyed driving it around more than he did a Pulse with a body, but he did have to stop for gas a lot more often! 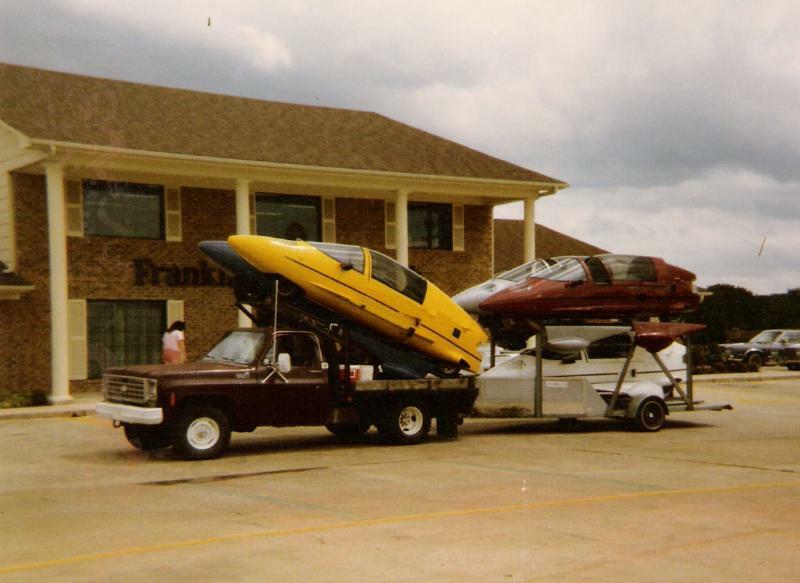 Ben purchased a burgundy Pulse in 1986 and put several thousand miles on it that summer. The vehicle may have been #251. When Owosso Motor Car Co. filed for bankruptcy in June of 1986, Rose Marine lost a lot of money. We had several dealers under us and at the peak of production, we had obligations to dealers that amounted to eleven vehicles per week. That is also all we could haul and were in the process of building a second trailer. Litestar of Texas had just sent OMCC deposits for about 76 vehicles and most of these vehicles were already sold. We were stunned when we learned that the factory had closed and Ed Butcher had moved production to his farm. Butcher said that he was building one vehicle per week and that we could have every 6th one. From then on we were told we would have to pay the new retail price which had just about doubled. So we had nothing to sell and that was the end of Litestar of Texas / Rose Marine and Airsports, Inc.
At the same time, Rose Marine was an ultralight dealer for a ten- state area and after the designer died, his widow took all of the company profits and built herself a nice multi-million dollar mansion, which bankrupted the company. This happened about two months before the Pulse collapse. At this point our company basically folded. We thought that we were just scratching the surface of Pulse sales. We spent almost nothing on advertising other than attending some auto shows and air shows. We couldn't advertise a lot because we couldn't deliver many vehicles. We were primed and ready for the 'Pulse in every garage' levels of production. 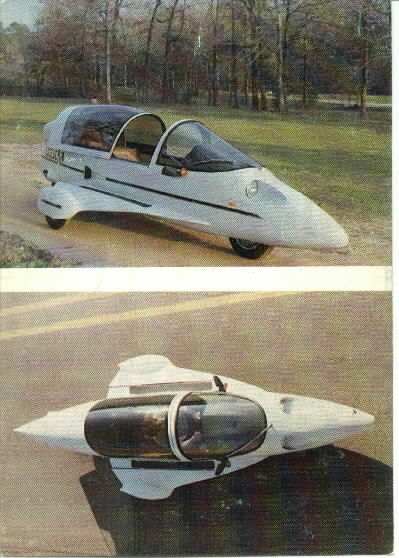 We were always frustrated that the quality of the vehicle was marginal. We wanted to go big time and Pulse needed some serious financial backing, hi-tech production facilities and quality manufacturing that would rival the big auto companies. Imagine what a Pulse would be like if Toyota, Honda or even Ford was to build it. And in 2005, with our gas guzzling SUVs and $2.00 per gallon fuel prices.....why don't we see Pulses EVERYWHERE! It just doesn't make sense. We also put together a home-made video which we gave to prospective buyers. We sent a copy to OMCC but they didn't care for it and never came up with one of their own as a sales tool. We were in negotiations with advertising companies to produce a TV ad (and not one of those "Hurry, hurry, come on down!" kind of wheeler-dealer ads, but a professional type ad like the 'Big 3'. Luckily we did not invest in those ads. Don Rose sold his farm land in order to re-pay customers who had lost their deposits. He didnt want them to suffer a loss because they had put their trust in him so he absorbed the entire loss himself. The factory stopped selling through dealerships and sold Pulses direct to consumers. Ben Scarborough had to go back to teaching as a band director and Don became successful in selling other unique products. According to the records of Don Rose......."We sold nearly 105 Litestar and Pulse vehicles." Quite a feat considering only about 360 cycles were ever built. And Ben dreams of once again owning a Pulse some day, but with his teachers salary and a desire to build another aircraft, he will probably have to keep on dreaming, at least for now.